Public engagement is an important part of being a PhD student, helping you to communicate your research to a diverse range of audiences. 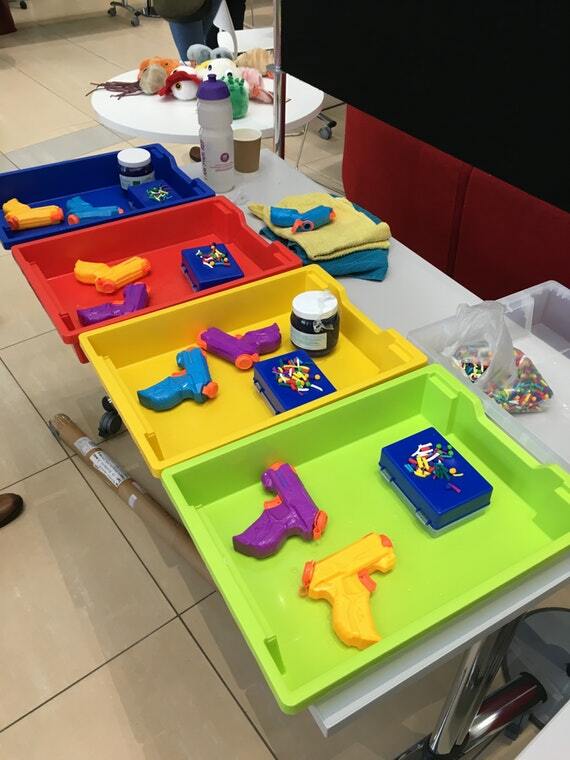 Here, Amy Smith from CITER (Cardiff Institute for Tissue Engineering and Repair) tells us how PhD students can get involved with their range of fun and interactive outreach activities. CITER is primarily a Cardiff University-based scientific network comprising over 350 researchers and academic staff from two colleges and nine schools working in research areas related to tissue engineering, repair and rehabilitation. Public Engagement is a key part of the CITER remit and we are regularly engaged in an increasing number of outreach events each year. 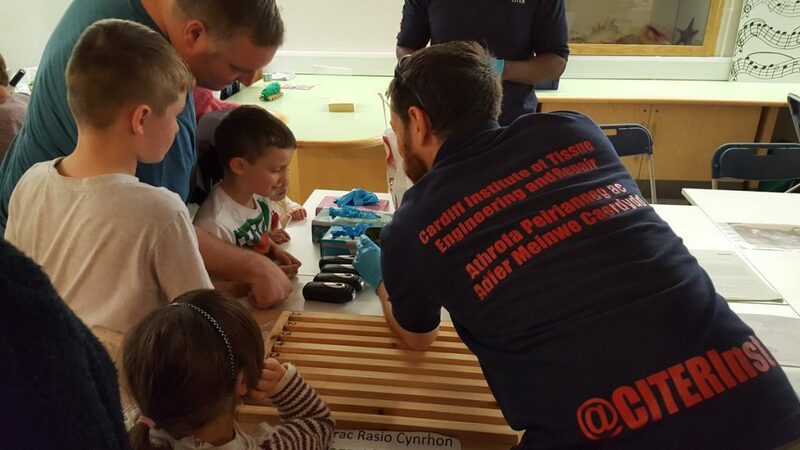 These include a wide range of public events and primary school visits across Cardiff, with which PhD students can get involved. Currently the portfolio of CITER’s outreach activities include four scientific, interactive and educational activities which capture children’s imaginations and inspire the next generation of scientists. These include maggot racing, blood and cells, blast-a-biofilm and bones and organs. In ‘maggot racing,’ children discover how doctors use insect larvae to promote wound healing, and ‘blood and cells’ explores the fundamentals of haematology and cell biology with an opportunity for children to make their own ‘cell’ using modelling clay. The ‘blast-a-biofilm’ activity is based on microbes; children participate in a scientific ‘experiment’ whereby clean and dirty areas of the classroom are tested. There’s also an activity which introduces core concepts in dental hygiene. The ‘bones and organs’ activity educates children about human anatomy and their placement in the body. By becoming a CITER member, PhD students will have the opportunity to deliver these activities, demonstrating science in a fun and interactive format. CITER requests volunteering one day per academic year as a minimum, so it’s not too onerous on your research time. Requests are sent to CITER from schools, and volunteers are given at least four weeks’ notice. CITER provides its members with informative and easy to follow training videos for each of the aforementioned activities which are available to view on our schools engagement website (this is members only content and is password protected). “I have been a member of CITER and a STEM Ambassador since 2010, and I volunteer for the outreach activities both in schools and at public events as often as my work schedule allows me to. Volunteering for these activities is very rewarding in so many different ways, both for us as volunteers and the children/young adults that we take the activities to. The activities are highly engaging, interactive and educational, plus engagement looks great on your CV. But most importantly, these visits are a lot of fun! In addition, to recognise a CITER early career scientist or student’s outstanding contribution to CITER engagement and outreach activities throughout the academic year there is also the new ‘CITER Contribution and Engagement Award’, with a cash prize awarded at the CITER ASM! If you are interested in becoming a CITER member and volunteering, please apply via our website. Please note that all CITER volunteers must be a STEM Ambassador. To find out more about CITER, get in touch at citer@cardiff.ac.uk or +44 (0) 29 2087 0129.